From an upscale barn dance to a fairytale soiree, Nestldown in the Santa Cruz mountains provides over 40 acres of lush gardens, gorgeous ponds, waterfalls, and orchards to give any bride-to-be plenty of inspiration. A family-owned property, Nestldown was originally designed as a retreat to provide a place of reflection. Today, the family's strong commitment to the community is seen at every turn. 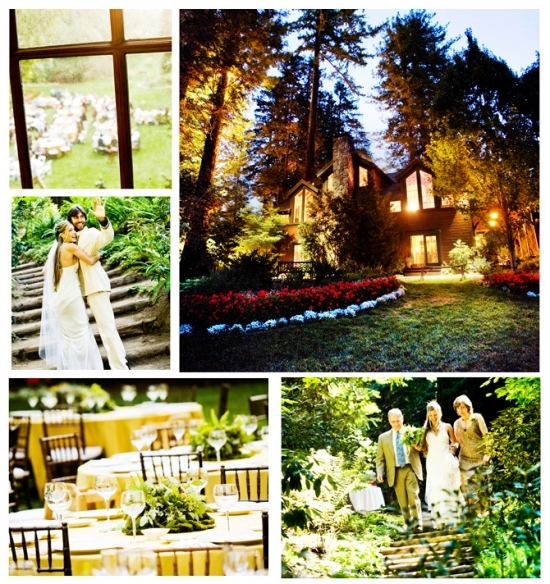 The Redwood glen is awe-inspiring and the perfect location for an intimate ceremony; however, I believe my favorite ceremony location must be the lily pond. The tranquil pool is bordered by a slate patio and the Redwood arbor is simply amazing! This amazing wedding celebration was originally featured on I Do Venues with photography by the talented Andrew Weeks. If you'd like to see more of Andrew's work featured on our blog, or want more information about the Nestldown - Click Here!